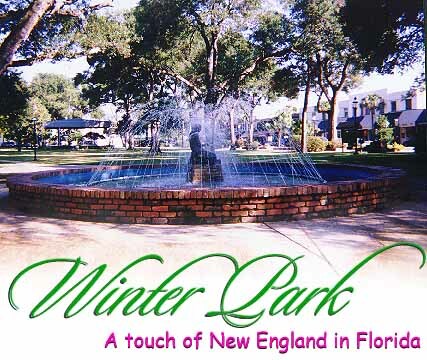 The Orange County City of Winter Park is located only about 15 minutes north of Orlando, Florida. At the same time, it has a removed, genteel feel. Winter Park FL was once frequented by wealthy people seeking a respite from the cold weather. It was considered a resort property market inCentral Florida real estate. today, it has a small town center with shops, art galleries and restaurants. It has a college and museums. Winter Park real estate includes community amenities, such as numerous parks, trails, lakes, other recreational opportunities and a golf course country club. Winter Park has many cultural features and attractions, too. Winter Park homes appear in quiet, vibrant neighborhoods near all these amenities, complete with plenty of their own delightful features. Homes for sale in Winter Park often attract nature lovers, culturally minded people and those simply looking for the quieter side of life away from the hustle and bustle. Many people come to Winter Park at first to vacation. They find in the slower, relaxed pace of the community a perfect recipe for winding down. Many of these same people find homes for sale in Winter Park more interesting than a vacation stay. They choose the relaxed, sophisticated town as their home. They choose the Winter Park lifestyle. Homes for sale offer them an assortment of styles, floor plans and price points to choose from, as they plan to enjoy their new lifestyle to the fullest. Find out more about homes for sale in Winter Park, Florida. Get real estate details on community attractions, conveniences and neighborhood amenities with a unique, map based search. Browse www.TolarisRealty.com. Then, get connected with expert advice and service at Tolaris Realty. The Winter Park hosts numerous festivals and events throughout the year to keep residents and visitors’ interest high. One event is the Sidewalk Art Festival. Its one of the oldest events of its kind and features about 1,200 artists from around the globe. It’s perhaps the most prominent art show for promoting art and art education in Central Florida. Find out more about the desirability and livability of Winter Park and its homes for sale. Modern Luxury - Tucked away in the Vias of Winter Park sits this Stylish, Contemporary Smart Home on Lake Maitland. The Brand New Lakefront Residence combines innovative design with brilliant architectural artistry, in a prime location that is both exclusive yet convenient. Just completed in 2018, this exquisite home features state-of-the-art technology throughout, accented by classic, elegant finishes such as Walnut Staircase, Landing and Interior Doors. Smart Home elements are iPad & Touch Panel integrated, and include Surround Audio, Lighting Control, Video Doorbell with off-site answering, Garage Door Control, Voice Control, Retractable Phantom Screens off Lanai, Interior/Exterior Wi-Fi Access Points, and Patio Screen Control. Other interior features include a gas fireplace, glass enclosed office space, formal dining room, and 2nd floor den. Chef's Kitchen features Luxury Dacor Appliance Package, and Dual Dishwashers, Double Ovens, Warming Drawers, Walk-in Pantry, and Wet Bar with Wine Cooler. Lakeside, enjoy your outdoor kitchen, gas fire pit, sparkling pool, and rinse off using the outdoor shower heads. Enjoy access to Lake Maitland, Winter Park's largest lake in the Chain of Lakes, from your backyard, and take in the views while you lounge poolside. One of kind Zachary Kauffman masterpiece on 1+acre on Lake Maitland now available. With his renowned attention to quality & detail, this 5+bed/5+bath has timeless traditional features + every modern amenity you can dream of. Thoughtfully designed w/stunning lake views from every room; Grand foyer welcomes to formal LR w/2 sided FP adjoining cozy Library, both w/custom millwork. East Wing is for FUN; Sports Room & Bar, w/5 TVs, impressive granite bar. Mirrored Exercise Studio, 6 seat Theatre. West Wing: Formal DR, Butler 8217;s Pantry w/wine frig to huge open Kitchen & FR. Gourmet stainless Dacor package; convection gas oven/range, microwave & warming drawers; Bosch DW, Thermador frig & freezer. Custom cabinetry, huge granite island, walk in pantry. Great entertaining space w/gorgeous view, walk out to lanai. Lux Master w/massive balcony, FP, coffee bar, Spa bath w/soaking tub, w/c + bidet, his/hers custom closets. 2nd level East Wing: 3 BRs ensuite w/walk ins + balconies; double desk, 2nd utility rm, loft w/charming shiplap, private office. South Wing: entry from motor court, 2 car gar, Home Office, Mudroom/drop zone, Utility w/craft bar, BR en suite, PLUS Bonus Studio w/kitchenette. Addl detached 3 car gar, 800 sq/ft 1/1 Guest Apt. Outdoor is private Florida oasis: huge paver lanai overlooks lake, Cypress trees, saltwater pool w/spa & beach. Gazebo w/Dacor grill, frig & FP. Covered Boathouse w/lift for sport boat + 2 jet skis; lg dock area for fishing & daydreaming. Full Feature list provided on request. Location Location Location! This is your opportunity to own this stunning Winter Park Estate just a short and beautiful walk to Park Avenue and everything it has to offer. The majestic residence sits on 1.5 acres and has over 280'on the enchanting Winter Park chain of lakes (Lake Maitland) The home boasts gorgeous lake views from most rooms, a lovely sprawling private master suite, formal living with a wood burning fireplace, elegant entrance, great kitchen for entertaining guest who want to see the lake views from the newly enclosed sun room. Over sized backyard with pool, open porch area, outdoor shower, impeccable landscaping throughout the yard & recently updated boat house. Beautiful home on Winter Park Chain of Lakes. Stunning estate on Lake Osceola with long private driveway to home that has gorgeous views of pool, gardens and lake. This one of a kind property has it all; privacy and charm in a fantastic Winter Park location. Large living room with lake views, fireplace and bay window. Large gourmet kitchen with top of the line appliances and eat in area overlooking pool and terrace down to the lake. Master bedroom has dramatic vaulted ceilings and cozy fireplace. Call for more information or to arrange a private showing of this beautiful Winter Park Lakefront Home. Timeless, classic, sophisticated, and exceedingly peaceful 8230; A once in a lifetime opportunity to live in a premier Winter Park Chain of Lakes estate home on almost an acre, walking distance to downtown Park Avenue. This one-owner custom home was designed by esteemed architect Steve Feller and expertly built by Don Jernigan with high quality workmanship and thoughtful detail throughout. Enter into a grand foyer with sweeping staircase, overlooking the formal living room 8217;s two story wall of windows showcasing beautiful Lake Maitland. The first floor has large and accommodating spaces, all with lake views, perfect for entertaining with a separate living room, formal dining room, & family room adjacent to the kitchen. The kitchen was renovated 3 years ago with all white cabinets, a beadboard island, stainless appliances, granite countertops, double ovens, a breakfast bar and large eating nook with abundant windows conveying brightness and light. There is also a 1st floor bedroom suite and an elegant, traditional home office with paneled walls. The 2nd floor has a master bedroom suite with large bathroom and huge walk-in closet, as well as 3 additional bedroom suites, a bonus loft, & media room with bar area. Features include fireplaces, crown molding, hardwood floors, French doors, coffered ceilings, built-ins, and lots of storage. Appx 119 8217; of lake frontage, perfectly manicured lawn, boat house & dock (as is), 2 car garage with capability to add 3rd, and zoned for Dommerich, Maitland Middle, and WPHS. A rare opportunity to own one of Winter Park 8217;s most distinguished homes. This beautiful, Tudor style, Lakefront home with guest house sits on over 1.2 acres on Lake Sue. This impeccably well-maintained home is extremely private and wonderful for entertaining. It features a downstairs master suite with separate sitting room, large bath and walk-in closet. Upstairs are three additional bedrooms and baths plus a bonus room. The kitchen/family room leads to a sun-filled dining room and formal living room with views of Lake Sue. Crafted with meticulous attention to detail, there are hand-hewn antique wood beams in the master and pecky cypress ceiling in the basement, wine room, front and back porch. This home has hardwood floors throughout, except the basement which is travertine, as well as 5-inch copper gutters and a gorgeous slate roof. French doors lead out to spacious courtyard, pool and barbecue. This home is surrounded by gorgeously landscaped grounds, and a large guest house with a full kitchen and bath and a two car garage. Enjoy the evening sunsets from your private boat dock and only blocks from Park Avenue, shopping and incredible restaurants. This meticulous Mediterranean-style masterpiece looks brand-new and is truly one-of-a-kind, showcasing attention to detail throughout. Encompassing a grand total of 10,072 square feet, the well-appointed open floor plan greets you with a great room boasting 200-year-old massive wood beams and 30-foot stone fireplace. You will also be delighted to find a chef 8217;s dream kitchen with two Sub-Zero refrigerators and two dishwashers. The rest of the home includes five bedrooms, nine baths, large media/game room with refrigerator and microwave, outdoor lanai and pool table, maple-paneled elevator, separate bar area and nearby 250-bottle wine cabinet. The master bedroom provides the ultimate in seclusion and offers a see-through stone fireplace and large dual walk-in closets, each with built-in dressers, along with a spa-like master bath. Outside you will discover your private tropical oasis with outdoor kitchen, luxurious heated and saltwater pool area with sun shelf and spa, outdoor shower and fire pit all surrounded on two sides by natural preserve. The exterior boasts reclaimed Chicago brick accents, adding to the intricate detail that makes this exquisite home truly unique. Additional features include natural gas, generator with full-house capacity, and built-in cabinetry and storage in the garages. The owners are leaving the two sets of washers and dryers for the first and second-floor laundry rooms. Perfect for comfortable living and entertaining, this residence will impress the most discerning buyer. One of Winter Park's premier Golden Coast Lakefront Estates. Walk to downtown Park Ave from this hidden, prime location situated on over three acres with 160 feet on Lake Maitland. This unique property on a quiet cul-de-sac features the main house with spectacular waterfront views and detached guest residence above 3 car garage with separate entrance from the porte cochere. Guest quarters offers full kitchen, additional bedroom, bathroom, living room, dining, inside utility and storage room. This Modern floor plan has been beautifully updated with custom chef's kitchen, designer solid-wood cabinetry, granite, true walk-in pantry plus 15x10 inside utility with additional refrigerator, pantry and storage conveniently located on the main floor. Floor to ceiling views greet you as you enter this lakefront private retreat with warm and inviting family room off kitchen, professionally appointed with craftsman wood detail and crown molding. Downstairs guest bedroom with private bath and large media room with additional full bathroom and storage closet. Spacious second floor master bedroom features a large picture window overlooking the lake. His and Her bathrooms plus den/office, workout area overlooking Lake Maitland with stunning outdoor entertaining area leading to your own private boat dock. Enjoy morning sunrises and glorious sunsets from this one of a kind Winter Park Estate. Also excellent opportunity to expand structure per FAR (Floor Area Ratio) allowable guidelines up to 15,000 square feet! Winter Park- Beautiful estate right off Park Avenue in the private Twelve Oaks peninsula subdivision. The residence sits on a 0.97 acre lot, offering the uncommon luxury of green space, a guest house, 5 car garage, swimming pool, hot tub and fountain all in the heart of Winter Park. The custom built home is California Styled Spanish Colonial with architectural relic 21/2 8221; inch thick front double doors with raised carvings, and 21/4 8221; inch thick Honduran Mahogany doors throughout the main house. The main homes offers 4 bedrooms, 4-1/2 baths, custom mosaic entrance foyer, custom coffered dining room ceilings, covered balcony and covered porch. Family room has 14 8221;ft ceilings with large beams and 3 walls of windows with french doors allowing for views and natural light. The study offers custom built ceiling to floor decorative shelving and mahogany floors. Well appointed chefs kitchen, custom wood cabinetry, walk in pantry all open to include large informal dining space and family room. Guest house with separate entrance, living area, private bath and bedroom, full kitchen and 2 balconies. Additional private gated entry for property access. Schedule your showing today! Under Construction. Completion is scheduled for spring 2019. Only two residences remain. Your opportunity to own unprecedented luxury in the most exclusive area of Winter Park has arrived. South Interlachen Place is around the corner from world famous Park Avenue, across the street from the Alfond Inn and just a stone 8217;s throw from the Winter Park Chain of Lakes. Comprised of six exquisitely appointed townhouses, South Interlachen Place is being built with premium level specifications; a standard of luxury usually only found in world-class destinations. The project was designed by award-winning architect Randall Slocum of Slocum Platts. Privacy is the top priority: every fee-simple residence includes a private two-car garage, private elevator to all levels and lush, mature landscaping defining the entrances. A truly unique aspect of the design is the extraordinarily large and private rooftop terrace for each individual residence, providing both covered and open areas for outdoor dining and entertaining. Each private rooftop terrace comes with a fireplace and powder bath. The residences are designed with age in place features throughout, allowing for the adaptation of changing lifestyles. Each townhouse embraces smart technology for entertainment, lighting, energy management and security. Live in one of the most extraordinary residences in a truly exceptional Winter Park location at South Interlachen Place.